A few months ago, I collaborated with Jon Mueller on the cover art for his new record "The Whole." 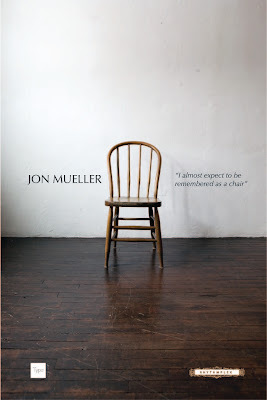 The record isn't out yet BUT you can see him perform the piece “I almost expect to be remembered as a chair.” this summer. I highly recommend it, he is an amazing artist and it seeing him live is very memorable. Above is a flier for the piece, not the cover of the album. Now I understand why he ask me to take photos of this old chair he brought with him to the shoot. See the rythmplex's Events Pagefor details on locations, dates, and venues.